TIAMO traces its roots to a small jewelry boutique founded in 1979 in Venice, rightly considered Italy’s capital of romance. Back then we just designed engagement and wedding rings to order, though our customers fell in love with the exclusive cut our pieces offered to the extent that our particular style began to thrive. Demand grew to the point that in 1984 we made the decision to move the company to Milan, a more industrial city. It was there in the fashion capital that TIAMO opened a design studio offering both wedding rings and, little by little, jeweler’s art. Since the very beginning our two top lines have been Colour Dance and Love Garden. With time the company took over Milan and in 1991 opened another location in Dusseldorf, representing our first foray out from behind our native borders. Europeans have a taste for fine jewelry, and by 1995 the brand was selling across the whole continent. In 2006 we entered the Russian market, and a decade later jumped the Atlantic to begin sales in the US. Even after more than a quarter century in the high-end jewelry market, TIAMO is just as committed as ever to improving quality standards in order to continue delivering the very best to our clients. TIAMO pays detailed attention to each step along the process we use to create jewelry, beginning from the selection of high quality stones, moving on to ordering our own unique cuts, and wrapping up with the setting. The brand’s rich legacy drives a unique, timeless brand that stands out from among our competitors. Exquisite work, outstanding design, and unparalleled quality are what have brought our clients through the door again and again over the past decades. Ready-made pieces are not the only services TIAMO offers. Engagement and wedding rings can be made to order from white, yellow, or rose gold, or even from other alloys as desired. The exceptional skill of our jewelers is built on the brand’s rich legacy, which is why TIAMO rings have a “comfort feel” that lets your fingers flex with ease no matter how wide the design is. The company uses only the purest, most richly colored, and highest rated diamonds for its pieces, while our unique cut for large diamonds creates a natural fingerprint. For us every new order is a challenge, and our jewelers plan their cuts with mathematical precision so as to maximize the natural radiance of each stone. The word TIAMO engraved on the inside of every ring serves as a guarantee of its authenticity. TIAMO stands for unsurpassed quality and a one-of-a-kind experience! We have spent the past few decades developing a quality control system that insists on elite standards for cutting jewels and semi-precious stones. TIAMO jewelry would never stoop to anything less than top of the line. All our stones are GIA certified and score elite marks for purity, color, cut, and size. 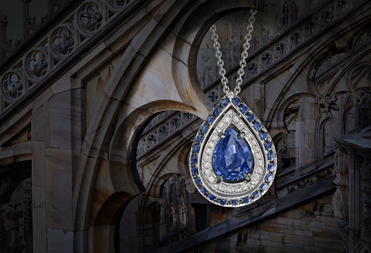 Inspired by the architecture of old Italy, TIAMO offers jewelry that is perfect for all occasions. The gorgeous aesthetics and elegant shapes we design beautifully exemplify the best of their new homes.